All sorts of businesses take advantage of the benefits of cloud-based applications these days. From SMEs in the telephony industry to large pharmaceutical or petrochemical businesses, the cloud has provided greater flexibility in working practices than has ever been available before. Even established businesses in the manufacturing and engineering sectors have been able to harness cloud applications to help them as well as sectors which you’d more likely associate with digital technology solutions, such as digital publishing businesses, for example. At Brandon Cross, we have helped companies in each of these sectors benefit from cloud applications – and we can help your organisation, too. We have a team of software specialists who have the know-how to provide up-to-date IT consultancy, training and development in secure cloud and web-based applications. For many business owners and IT directors, turning to the power of the web to run their applications means relinquishing control of their security systems. However, done correctly this can be an advantage since many web-based systems are more secure than you could achieve in-house. What’s more, they often provide cutting-edge security at a fraction of the cost that you could achieve by keeping your applications running from your own servers. To get the balance right between opening up access to authorised users of your software applications via the web and restricting access to things like customer data, bespoke solutions and interfaces are often called for. This is where Brandon Cross comes in. With our expertise in cloud-based applications, you can obtain all of the upsides without running any of the major risks. Why not look at how the cloud can improve your organisation’s workflows and offer clients greater flexibility? 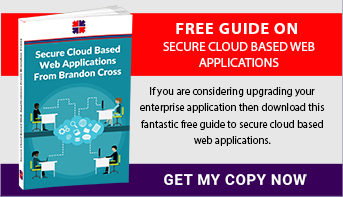 If you would like to know more about this exciting area of information technology and how it can benefit a wide range of business models, then download our guide – Secure Cloud Based Web Applications. It is free and packed full of useful information. Alternatively, if you’d like to talk to someone about your ideas for deploying cloud-based applications in your business, we’ll look forward to hearing from you.